The final dance, the wobble of wobbles, the long kiss good night, the final blow, the party that will enlighten your heart and soul. The SlowBlow “party” is coming to an end! After an amazing 4 years at our beloved Goodgod Small club, we are at turning point and its time to ice the party to explore new worldly antics and continue on a quest to dj in the most bizzare of places and parties on earth. Ahh the memories….the lost memories…..the blurry memories…..ah how good they all are! 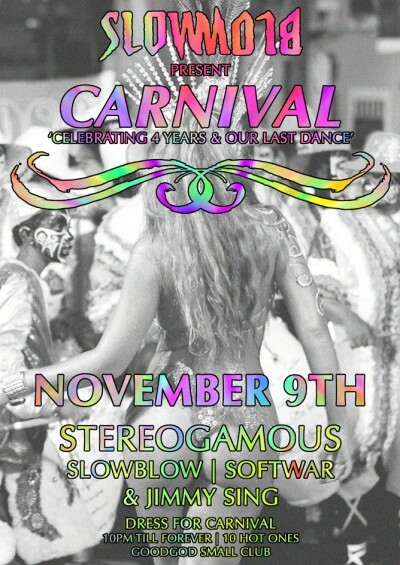 To celebrate we are throwing our own CARNIVAL AKA CARNAVAL!!! Think Every amazing song you have heard in the last 4 years!!!! We are going to transform Goodgod Small club into a brazilian sweat box from 10pm till forever. Put your best feather, diamonty encrusted g-sting on and get ready to shake a leg.